Join this engaging session as BrightTALK conducts an in-depth interview with Ian Glover, President of CREST. Proper implementation and management of Application Security Testing (AST) can reduce costs and boost effectiveness of your application security strategy. What have we learned from 2017's biggest breaches and how will we deal with 2018's emerging threats? Attempting to look both backward and forward over the cyber landscape, Peter Wood will review lessons learned and apply them to the evolving threatscape. If your processing and data is in the cloud, how can you deliver assurance, compliance and governance? How do you find the flaws and soft spots that criminals will exploit? From browser to database, through human factors and end points, this presentation will take a threat-based approach to securing the cloud. 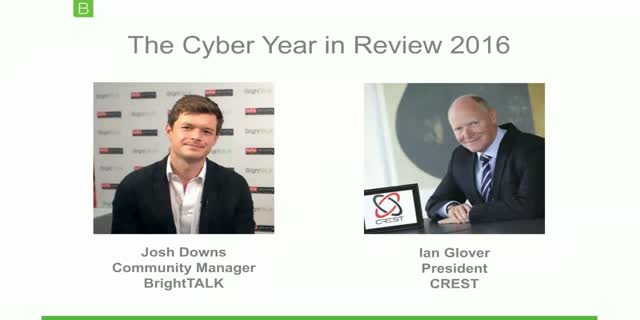 BrightTALK caught up with CREST president Ian Glover for an in-depth conversation on the current state of information security, today's threatscape and a discussion on the cyber industry. The Internet of Everything affects everyone from multi-nationals to private citizens. The universal adoption of machine to machine communications in every aspect of our lives offers criminals a hugely expanded attack surface. How do we defend ourselves without undermining the benefits of the IoE? BrightTALK caught up with IBM Security Europe's Martin Borrett for an in-depth conversation on the current state of information security, today's threatscape and a discussion on the cyber industry. To find out more about IBM Security, click the link in the attachments tab. BrightTALK caught up with Titania's Ian Whiting for an in-depth conversation on the current state of information security, today's threatscape and a discussion on the cyber industry. BrightTALK caught up with Gotham Digital Science's Justin Clarke-Salt for an in-depth conversation on the current state of information security, today's threatscape and a discussion on the cyber industry. BrightTALK caught up with Obrela Security Industry's George Patsis for an in-depth conversation on the current state of information security, today's threatscape and a discussion on the cyber industry. - How banks are still juicy targets for cyber criminals and what they can be doing to ensure they're fully protected. - How to get the maximum results from a security budget. Threat-based testing, accurately simulating criminal attacks, is a critical approach in securing FinTech. Attackers constantly evolve their attack methods and strategies in response to changing technologies, making it essential that security tests match the threat landscape. BrightTALK caught up with NCC Group's Matt Lewis for an in-depth conversation on the current state of information security, today's threatscape and a discussion on the cyber industry. BrightTALK caught up with The IISP's Piers Wison for an in-depth conversation on the current state of information security, today's threatscape and a discussion on the cyber industry. BrightTALK caught up with Beta Systems Leslie Parsonson for an in-depth conversation on the current state of information security, today's threatscape and a discussion on the cyber industry. BrightTALK caught up with The MET's Andrew Gould for an in-depth conversation on the current state of information security, today's threatscape and a discussion on the cyber industry. BrightTALK caught up with Symantec's Tarah Wheeler for an in-depth conversation on the current state of information security, today's threatscape and a discussion on the cyber industry. BrightTALK will be broadcasting its in-depth interview with CREST President Ian Glover and Nettitude MD Rowland Johnson jointly in conversation. - Incident response and steps to take if you've been breached! All this and much more - join us for the broadcast. The majority of internal and external cyber-attacks begin with exploiting vulnerabilities in the network and targeted applications. Over 99% of actual attacks exploit known vulnerabilities listed as known Common Vulnerabilities and Exposures (CVEs). The traditional defence is to probe the system using manual or automatic vulnerability scanning techniques; but this produces a lot of redundant and irrelevant information that does not shed any light as to whether a hacker can use the vulnerability to reach a critical asset. The only solution today is human penetration testing, but infrequent testing does not reflect the network's dynamic nature, especially in today's virtual and cloud based environments. A fresh approach to support manual penetration testing and enhance cyber resilience is to continuously and automatically test the network, applications and databases by using penetration testing techniques to expose vulnerabilities, establish complex attack path scenarios in real time and provide security and business insights to act on. This presentation will look at the technology and role of machine-based penetration testing. Key network infrastructure devices are overlooked yet they provide critical functionality. Exploiting web application weaknesses and service buffer overflows is exciting, but the housekeeping of network infrastructure is not. Issues in network infrastructure devices can lead to network wide problems that would cause system admininstration nightmares. This presentation provides a review of key security devices, often side-lined when looking at security. It covers the value of these devices to "Blue Teams", issues "Red Teams" can highlight, desired outcomes and auditing practices. The results of all the network penetration tests conducted by the First Base team over the past year have been analysed by Peter Wood. The annual review covers clients in a variety of sectors including banking, insurance and retail. This presentation identifies the most common vulnerabilities, how they can be exploited and the consequences for each business. Learn in detail how criminals can take advantage of these weaknesses and how you can secure your networks using straightforward techniques.